Yoga4Cats won the Young Philanthropists Giving Circle’s yearly grant. 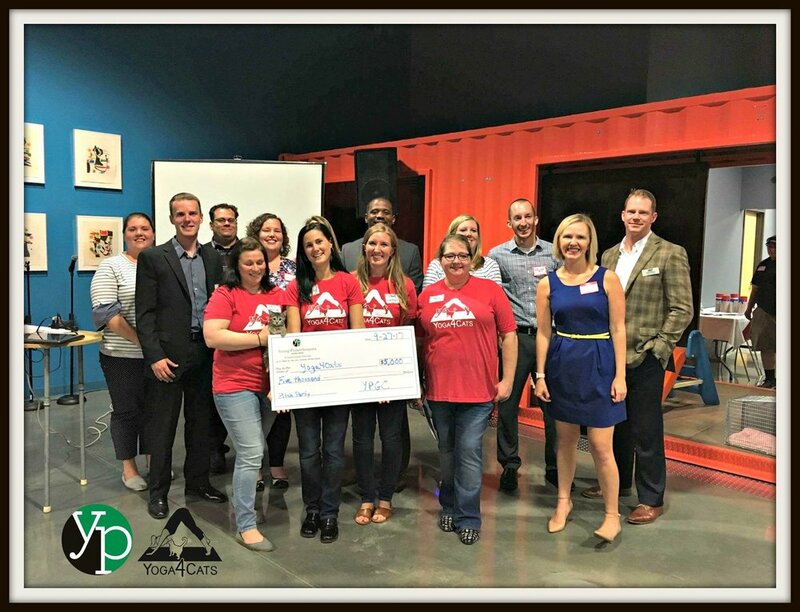 This year, the YPGC hosted a pitch party and let the audience decide which of the five nonprofit pitches should win the $5,000 grant. Other presenters included Big Brothers Big Sisters, Decatur Park District, MRI and Northeast Community Fund. With the $5,000, Yoga4Cats will be able to implement their proposed WeTNR (We Educate Trap Neuter Return) program and fund it completely for 2 years. Through WeTNR, Yoga4Cats will educate the community on stray and feral cats as well as the benefits of trap, neuter, return. The group will also provide hands on assistance with trapping, adoption assessments and, if the cats qualify, placement into a foster home. Within the two years funded by this grant, Yoga4Cats projects they can trap 70 cats, which in turn, will prevent over 10,000 kittens from being born. Yoga4Cats has partnered with the Humane Society of Decatur and Macon County (HSDMC), the Animal Protective League (APL) and Macon County Animal Control and Care Center to create Operation Help Meowt. The partnership was created to assist an indoor/outdoor cat colony that has grown out of control and currently houses over 70 cats and kittens. Assisting these cats comes at a cost as all need veterinary care. Yoga4Cats is asking for the community’s help in raising funds to care for these cats and has a goal of $2,500. This colony has become unmanageable due to the vacuum effect. When cats are removed from an outdoor colony, but a food source remains, more cats come to take their place. The vacuum effect is why catch and kill is not an effective measure to control feral cat populations. On the other end of the spectrum, well-intended people can make this same mistake by bringing cats indoors. New cats will continue to inhabit the colony, and without spay and neuter, population control is impossible. Operation Help Meowt will be working to remove the cats brought indoors from a colony that has gotten out of control for the caretakers. On Saturday, April 7th, Yoga4Cats and HSDMC began the project by removing 43 cats: 7 mothers, 34 nursing kittens, and 2 weaned kittens. Yoga4Cats accepted 3 nursing moms and litters, HSDMC accepted 2 moms and litters, which are now at APL, and APL accepted 2 moms and litters and 2 weaned kittens. In the upcoming weeks, Yoga4Cats will be going back to trap the remaining cats for spay, neuter, and vaccinations. We will also be posting the deCATurFosters that will be available for adoption and soon taking applications! You can donate to OPERATION HELP MEOWT using the Donate button at the bottom of this page. Donations are also accepted on Facebook (www.facebook.com/yoga4cats), through PayPal (www.paypal.me/yoga4cats) or by mail to P.O. Box 712, Decatur, IL 62525.